Nashville renegades, The Legendary Shack Shakers, play just about every strand of roots music that can be imagined but with a rare and real punked up intensity that is a direct contrast to the run of the mill Nashville mainstream. J.D. Wilkes, vocalist and harmonica player with this great band obviously needed something to feed his more folk oriented proclivities and so along with wife Jessica and fellow Shack Shakers refugee, bassist Mark Robertson, the Dirt daubers were born! J.D. handles vocals, banjo and harmonica, whilst Jessica also takes some of the vocals and mandolin, with Robertson on bass, plus Steve Latanation, who adds percussion to the album. There are only four traditional songs on this album, with the remainder being penned by the two Wilkes plus one co write with Robertson. The casual listener can be forgiven for thinking that all of the songs are as old as the hills, thanks in part to the instrumentation but also because of the natural style that this tremendous trio impart to this all too short (less tha half an hour!) album. Of course, with it’s relentless driving sound the album could be a little tiring but the Daubers ensure that everything is short, sharp and to the point without any of the window dressing or ornamentation so beloved of many other roots musicians. The songs themselves are in a mix of styles with some having a jazzy feel, several blues and some that could be classed as straight(ish!) country but all played with an ‘old-time’ sensibility, giving the album a feel that could have been recorded last year or eight decades ago! 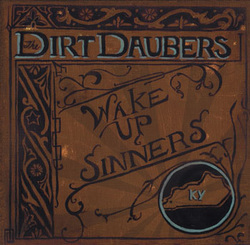 Prior to their first, and even shorter album, ‘The Dirt Daubers,’ I had never heard of Jessica before but it is her that adds a tremendous amount of quality and variety to this album with her lovely, sassy full of character vocals and driving mandolin playing, and can only assume that her songwriting is pretty good as well, with her receiving co-writer credits on all but the traditional songs. The album kicks off with J.D. taking lead vocals on the traditional Wayfaring Stranger with Jessica on harmonies and J.D’s excellent banjo playing providing a repetitive foot tapping beat that really harks back to those eerily weird old hillbilly days! A Wilkes co-write Be not afraid has Jessica on vocals, with a beautiful sounding accordion easing the song along in an almost eastern European folk vein, whilst the traditional Say darlin’ Say also has Jessica’s gorgeous lead vocals driven along by the incessant banjo and harmonica which provide a counterpoint to her femininity! Next up are J.D’s lead vocals on the eerily spooky Can’t Go To Heavan with his banjo and Jessica’s harmonies giving the song an almost otherworldly feel. I still can’t believe that the Wilkes/Robertson penned Trucks, Tractors and Trains is not a traditional country song, whilst the highlight for me is the traditional Single Girl with Jessica again on lead vocals and Robertson’s incessant bass propelling the song along, more than ably assisted by J.D’s banjo. Picking a favourite is almost an insult to the rest of the album, with every track being just about as essential as it’s neighbours. All in all, a tremendous, if too short album, by a hugely talented trio of musicians that play in a variety of old time styles/genres, but all recognisably The Dirt Daubers!